Designed by Hythe naval architect C P Clayton, the HOTSPUR was 80ft in length 15ft in breadth and had a depth of 6ft. 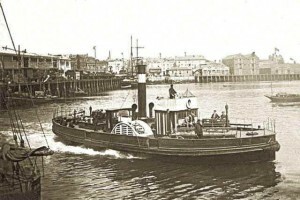 Her paddles were turned by a 25hp oscillating cylinder steam engine, probably one of the last of that type, capable of moving the vessel at a speed of about 8 knots. Her registered tonnage was 39 net, 62 gross and she was built to carry 200 passengers. She was sold on January 1 1915 to the General Estates Co, renamed GEC and after having her machinery and fittings removed, her hulk was taken to Dibden bay where it eventually rusted away. The registration was cancelled on May 12 1930. The launching of the second Hotspur took place at the East Cowes yard of John Samuel White and Co on January 17 1927. She was 80ft long, 18ft wide with a moulded depth of 6ft 3in. She was a twin-screw motorship propelled by one Vickers Petter 140bhp 4 cylinder, reversible type, heavy-oil engine arranged to drive a propeller at either end of the vessel (remember the war story? ), and move her at speeds of up to 10.5 knots. She also had a Vickers Petter auxiliary set, coupled to an air compressor, the function of which was to supply starting air to the main engine and for driving the electric generator and general service pump.The second Hotspur had an interesting incident during the Second World War, when making the crossing under the command of Mr W Banks. She triggered off an acoustic mine, it is thought by her disengaged free spinning forward propeller. Both ship and passengers escaped possible disaster with a thorough drenching. She was certified to carry 300 passengers. When Hotspur IV was commissioned in 1947 Hotspur was transferred and ran from Yarmouth. She later became a restaurant in London on the north bank of the Thames. She was removed from the site in the mid-seventies.